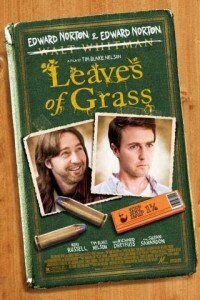 In the movie “Leaves Of Grass” Edward Norton plays duel roles, twins, to be exact. “Leaves Of Grass” tells the story of an Ivy League professor (Edward Norton) who is lured back to his Oklahoma hometown, where his twin brother (), a small-time pot grower, has concocted a scheme to take down a local drug lord (Richard Dreyfuss). It seems no role is too big or small to keep Edward Norton from pursuing his first Best Actor Oscar. Set in the future, Robot & Frank is a dramatic comedy, a buddy picture, and, for good measure, a heist film. Curmudgeonly old Frank lives by himself.